Ok, so you get the idea. They get home from school yesterday and they discover that this snow is the world’s BEST snowman building snow. Seriously, you can literally roll up the snow. 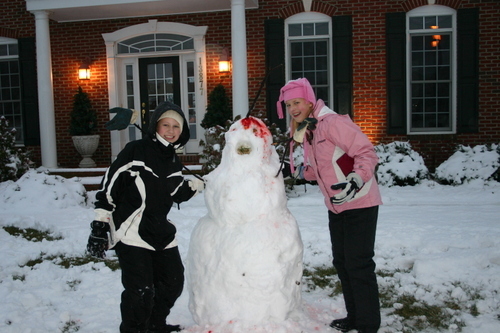 My girls are initially building a snowman together…that is until the younger one decides to build a “Calvin and Hobbes” snowman. My daughter is on the left. The other child is a neighbor. My older daughter was horrified and stomped off in disgust once the stake in the head and the fake blood appeared. My eldest daughter is really much more of a rainbows, puppies and unicorns type and she did not think this snowman was one bit funny….not one bit!! 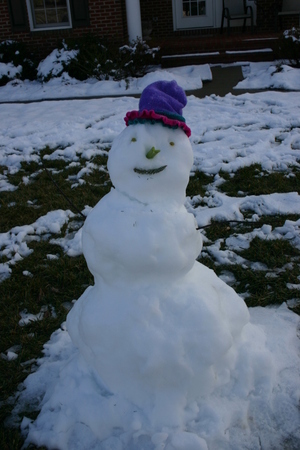 So she built her own snowman by herself. 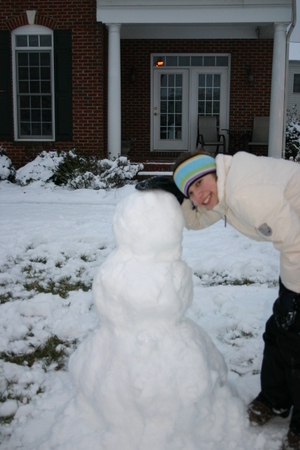 Here is her sweet little snowman. Look how she is patting him lovingly on the head…or maybe protecting him from a stake in his brain. I swear, I gave birth to BOTH of these children! I have a few children that will be getting a new Calvin and Hobbes book today.